It's just that simple! 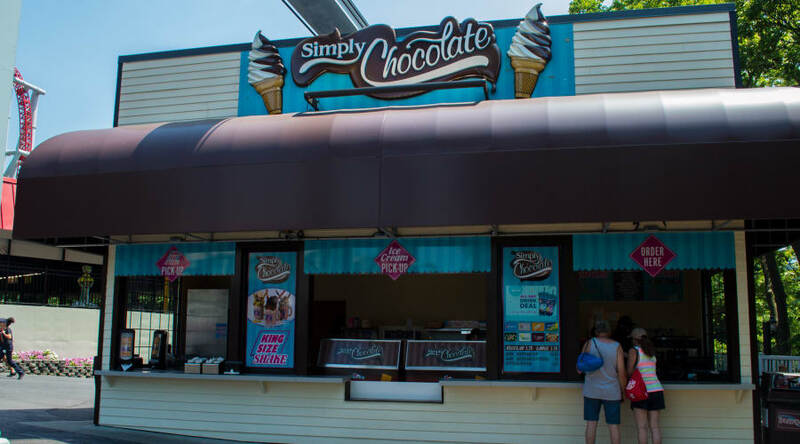 If you're looking for a signature Hershey's experience, look no further than Simply Chocolate℠, home of the award-winning King Size Shakes, located in the Founder's Way℠ area. Don't think you're ready for the King Size challenge of finishing a shake? Enjoy a hand-dipped or soft serve cone or dish! Hot Fudge - High fructose corn syrup, milk chocolate (sugar, milk, chocolate, cocoa butter, lactose, milk fat, soy lecithin, and PGPR (emulsifiers), vanillin (artificial flavor)), corn syrup, nonfat milk, partially hydrogenated coconut oil, sugar, water, contains 2% or less of: cocoa, modified corn starch, whey (milk), monoglycerides, artificial flavors, disodium phosphate, potassium sorbate (preservative), salt, sodium citrate, and xanthan gum. Chocolate Syrup - High fructose corn syrup, corn syrup, sugar, water, cocoa *, contains 2% or less of: potassium sorbate (a preservative), salt, mono and diglycerides *, polysorbate 60 (an emulsifier), xanthan gum, and vanillan, an artificial flavoring. *Adds a negligible amount of fat. Strawberry Syrup - Strawberries, corn syrup, sugar, high fructose corn syrup, water, less than 2% of: modified corn starch, propylene glycol, xanthan gum, citric acid, sodium benzoate (preservative), Red 40, artificial flavors. Caramel - Corn syrup, sweetened condensed nonfat milk (contains nonfat milk and sugar), sugar dairy butter, water, high fructose corn syrup, contains 2% or less of: salt, disodium, phosphate, mono and diglycerides, pectin, sodium citrate, vanillin (an artificial flavoring), ethyl vanillin (an artificial flavoring). Hershey's Chocolate Magic Shell Topping - Sugar, partially hydrogenated soybean oil, coconut oil, cocoa, soya lechitin, artificial flavorings, may contain dairy. Peanut Butter - Peanuts, peanut oil, sugar, salt, and cornstarch. Reese's Pieces - Sugar, partially defatted peanuts, partially hydrogenated vegetable oil, (palm kernel and soybean oil), reduced minerals whey (milk), dextrose, contains 2% or less of: corn syrup, salt, soy lecithin, artificial color (Blue 1 Lake, Red 40 Lake, Yellow 5 Lake, Yellow 6 Lake), carnauba wax, resinous glaze, and artificial flavor. Peanut Butter Mini Chips - Partially defatted peanuts, sugar, blend of vegetable oils (contains partially hydrogenated palm kernel and soybean oils), nonfat milk, dextrose, salt, soya lecithin (an emulsifier), and vanillin (an artificial flavoring). Reese's Peanut Butter Cups - Milk chocolate (sugar, cocoa butter, chocolate, nonfat milk, milk fat, lactose, and soy lecithin and PGPR (emulsifiers), peanuts, sugar, dextrose, salt, and TBHQ (preservative). Peanuts - Peanuts, dry roasted. *Allergen Disclosure Requirement: This product contains peanuts and/or tree nuts, which can cause severe or fatal allergic reactions. Use of this product as an ingredient in food preparation must be conspicuously and adequately disclosed to potential customers. Milk Chocolate Chips - Milk chocolate (milk chocolate contains sugar, chocolate, nonfat milk, cocoa butter, milk fat, soya lecithin (an emulsifier), and vanillin (an artificial flavoring). Oreo Cookie Crumbs - Sugar, enriched flour (wheat flour, niacin, reduced iron, thiamine mononitrate (viamin B1), riboflavin (vitamin B2 & B3), folic acid), palm and or high oleic acid, canola and or soybean oil, cocoa (processed w/ alkali), high fructose corn syrup, baking soda, cornstarch, salt, soy lecithin (emulsifier), vanillin - an artificial flavor and soy lecithin. Rainbow Sprinkles - Sugar, corn starch, partially hydrogenated vegetable oil (cotton seed, soybean) dextrin, Soya lecithin, confectioners glaze, FD&C Red 40 Lake, FD&C Yellow 6 Lake, natural and artificial flavor, carnauba wax, FD&C yellow 5 Lake, FD&C Blue 1 Lake, FD&C Red 3, FD&C Red 40. Chocolate Sprinkles - Sugar, corn starch, partially hydrogenated vegetable oil (cotton seed, soybean), rice flour, cocoa (cocoa processed with alkali) dextrin, soya lecithin, confectioners glaze, natural & artificial flavor, canauba wax, cellulose gum, carrageenan, FD&C Red #40 lake, FD&C Yellow #6 lake, gum tragacanth, gum Arabic, FD&C Yellow #5 lake, FD&C Blue #1lake, FD&C Blue #2 lake, FD & C red 340. FD & C yellow #6, FD & C yellow #5, FD & C blue #1, FD & C red #3, FD & C blue #2, green #3, caramel color, titanium dioxide, salt Whipped Cream - Cream, nonfat milk, corn syrup, sugar, mono and diglycerides, natural and artificial flavor, carrageenan, propellant, nitrous oxide. Contains: Milk. Maraschino Cherries - Cherries, corn syrup, water, artificially flavored, artificially colored with red 40, preserved with benzoate of soda, citric acid, and sulfur dioxide. Cookies N' Cream – Milk, cream, sugar, cookies (sugar, enriched flour (wheat flour, niacin, reduced iron, thiamin, riboflavin, folic acid), partially hydrogenated soybean and/or cottonseed oil, cocoa processed with alkali, corn syrup, corn flour, cornstarch, chocolate, salt, sodium bicarbonate, natural and artificial flavor, lecithin, nonfat milk], corn syrup, whey, nonfat milk, mono and diglycerides, artificial and natural flavors, guar gum, carrageenan. chocolate chunk semi-sweet (sugar, chocolate liquor, cocoa butter, milk fat, soy lecithin (an emulsifier), salt, and vanilla), wheat flour enriched (niacin, reduced iron, thiamine mononitrate, riboflavin, folic acid), malted barley flour, butter (milk), granulated sugar, light brown sugar, eggs, salt, baking soda (sodium bicarbonate), and vanilla flavor (water, alcohol, sugar, and vanilla bean extract).